Can you even believe it is September already??? I can't! The first 4 weeks of school have flown by for me. I will admit that I'm already looking forward to the 2 week fall break my new district has! But in the mean time, I'm linking up with Farley over at Oh Boy Fourth Grade for her monthly Currently. You can link up by clicking on the button below! Loving: I absolutely love my new school. I've have some rough spots as I get used to a whole new world, but I am so happy I made the change. My teammates are also awesome. Thinking: Seriously-if I would just do more blogging/TpTing, I know I would get faster at it. But I do it so sporadically that I feel I have to reteach myself the most basic things every time. Wanting: Don't get me wrong. I love to cook and clean. I spend my entire summer doing just that. But once school starts, it becomes one of the most monotonous things on my to-do list. I had a maid service once, but I found myself staying up late to clean the house the night before because I didn't want them to think we were slobs. Kind of defeated the purpose. Needing: We've been in school for 4 weeks, and our new literacy curriculum just arrived. It's totally different from what I've ever done and what we've been doing so far. I really need to come up with a plan on how to make it work for me and my students. 3 Goals: My first goal is to be a better time manager. I waste so much time when I get home, and then I'm frustrated when I have to stay up late to work. This leads me to goal #2, which is to have more family time. I want to have more of my weekends for my family, but I save so much work for the weekends, that it is almost impossible to do anything "fun" with them. So...it's kind of ironic that as I struggle to find more time for my family that I also want to blog/TpT more. But I am confident I will find a way! I can't wait to check out more Currentlys! Have a great week and check back to see my classroom reveal as part of #2getherwearebetter link-up with Ashley from Schroeder Shenanigans in 2nd and Angie from Lucky Little Learners! The link will go live at 6am CST on Wednesday, September 2nd. Click on the picture below to check it out! 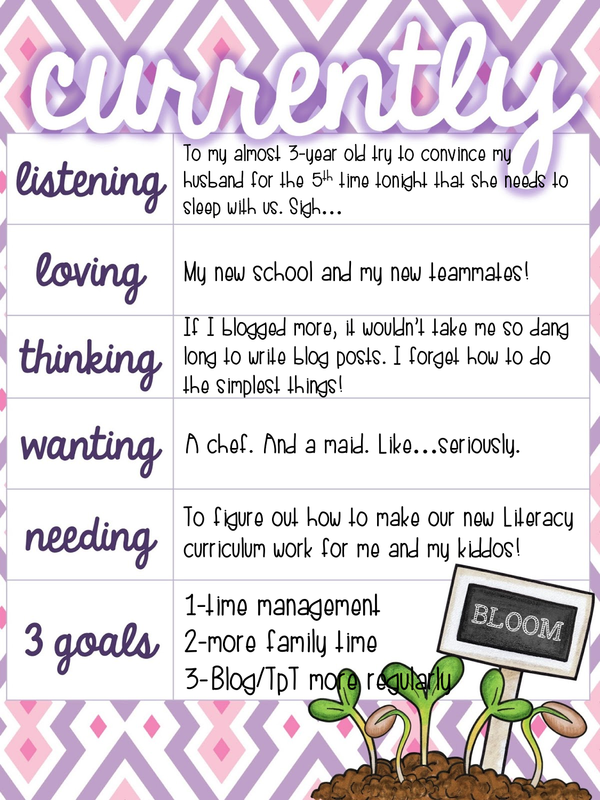 I am like you, I need to blog and TPT more. I am becoming more organized because I seem to forget something, but I also need time management as well. Have a great week!! I totally agree with you, finding that balance between working full time, taking care of your family and our TPT lives can be challenging. The good news is that we are all here to support each other and we can do this! Good luck with your goals!! I love watching your scopes! You make me smile!! !